Microsoft Visual Studio is an integrated development environment (IDE) created by Microsoft. Initially the system was designed to develop computer programs for Microsoft Windows as well as websites, web applications and web services. Today, Visual Studio is used to develop beautiful applications for desktop and mobile platforms, web applications and cloud-based services. 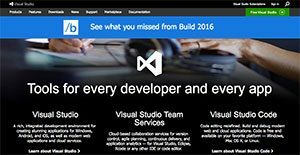 For larger teams, Visual Studio provides version control, agile planning, and application control. Coders also have their own version of Visual Studio, which enables them to work on codes for free on popular platforms like Windows, Mac OS X, and Linux. Visual Studio comes with a code editor that supports IntelliSense (the code completion component) as well as code refactoring. On top of that, the system also has built-in tools such as a forms designer for building GUI applications, web designer, class designer, and database schema designer. It's important to realize that virtually no software in the IT Development Software category will be an ideal solution that can meet all the needs of different business types, sizes and industries. It may be a good idea to read a few Microsoft Visual Studio reviews first as some services can excel just in a very narrow set of applications or be created with a very specific industry in mind. Others may operate with an intention of being easy and intuitive and consequently lack advanced functions desired by more experienced users. There are also apps that focus on a large group of users and offer a complex feature base, however this in most cases comes at a more expensive price of such a service. Ensure you're aware of your needs so that you pick a solution that provides all the features you look for. How Much Does Microsoft Visual Studio Cost? Cloud and Standard subscriptions are offered on a monthly or annual basis. There is also a Standalone License available. Several features come with each plan and what we have here are just general offerings. For more details you can check the vendor’s website which includes a comparison chart of the features and benefits of the two subscription plans. We realize that when you make a decision to buy IT Management Software it’s important not only to see how experts evaluate it in their reviews, but also to find out if the real people and companies that buy it are actually satisfied with the product. That’s why we’ve created our behavior-based Customer Satisfaction Algorithm™ that gathers customer reviews, comments and Microsoft Visual Studio reviews across a wide range of social media sites. The data is then presented in an easy to digest form showing how many people had positive and negative experience with Microsoft Visual Studio. With that information at hand you should be equipped to make an informed buying decision that you won’t regret. Some of what Microsoft does best can be seen here. Visual Studio taking on C#. A great IDE in today's market. The latest version is awesome! A great IDE to have ever existed! What are Microsoft Visual Studio pricing details? What integrations are available for Microsoft Visual Studio? Pros: Being a front end developer, I began coding with Dreamweaver. As I entered the world of business, I had to utilize Visual Studio. When I first used it, I absolutely hated it. But after several years, I fell in love with everything it's offering. It's getting better with each update and I like its add-on apps as it made things easier for me dealing with coding work. Cons: Nothing much to hate. I had to include a plugin capable of disabling the code zooming. I tend to accidently zoom code whenever I scroll upward/downward my current page. Pros: So far, it's debuggin and testing functionality are great. I like how each user can switch them to help enhancing their experience in coding. I like its dark theme. Intellisense has been a huge help. I began coding within C# sometime back and it was very much convenient to look at pertinent details that are related to my code. Cons: Visual Studio will significantly put other processes to a crawl. This is due to its significantly heavy build. The latest version appears to be working a lot efficiently compared to its older version. Does a lot of things I want it to do and for source control use. A nice blend of productivity and fun worth using! If you need more information about Microsoft Visual Studio or you simply have a question let us know what you need and we’ll forward your request directly to the vendor.